Hallelujah ! He is Risen ! Easter is very special to me. It's the time I celebrate that Christ not only died for me but that He also arose from the dead and will one day raise me up to be with Him for eternity. What a comfort knowing that when my earthly life is over, my heavenly life will begin. 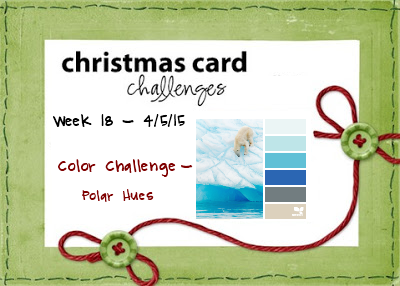 Note: In case you're wondering, I used the 4th & 5th colors in the Polar Hues color chart. I saw a fun technique on the CardMaker Blog this past week and thought I'd give it a try. I certainly have plenty of glitter (side note to everyone . . . this uses a lot less glitter than I thought it would, so I won't be reducing my stash any time soon). I actually took step-by-step pictures, so this is my first photo tutorial~and there are lots of pictures. So, grab your craft supplies and follow along. Printer Paper or "Glitter Catcher"
Note: the packing tape didn't cover the entire cutout area, so I lined up a second piece to cover the remaining area. Turn your piece over and sprinkle glitter all over the "taped" area. It's probably best to do this on top of a piece of paper or tray so you don't get glitter all over your table. Now, cover the glitter with cardstock/paper/etc and press and rub. Then press and rub some more. I used a craft spoon without a cover piece to do this part; it helped to be able to see what I was doing so I could be sure to get glitter stuck into all the little nooks and crannies. Below: with paper over the glitter. This way is a bit less messy, but I did like the above method so I could "squish" the glitter into all the areas. When you've got as much glitter stuck to the die cut image as you can, then turn it over, tap and remove all the excess glitter. I liked this look so much that I did a second one using a gold/copper glitter. I recently bought a "second-hand" stamp (for only $1, who could resist, right?). I knew I wanted a simple sentiment on the front and the sentiment on this stamp fit the bill. So I masked off the image with tape and inked up the sentiment. I used Color Box Royal Blue Pigment Ink and clear embossing powder. Note: Remember to remove the tape before stamping. In my excitement, I forgot to do this the first time . . . I guess I was still in awe of the way the glittery die-cut came out. **See the smudge at the bottom of the sentiment in the first photo? Fortunately my second try came out perfect. Finish your card or project. Yup, it's that easy. You now have a beautiful piece to add to your card or scrapbook page . . . and it's only limited to the colors of glitter you have available. 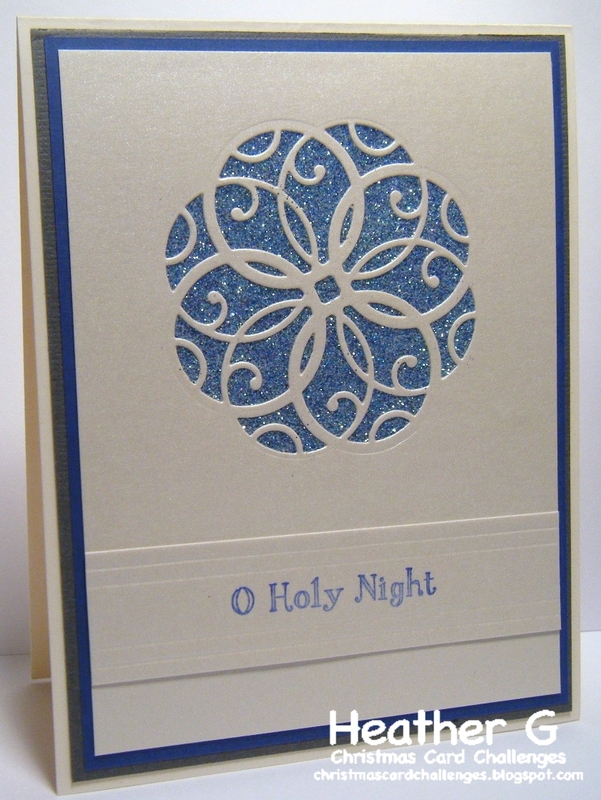 Please stop by the Christmas Card Challenges blog to see what the other Design Team members created this week. Even though Christmas feels sssoooo far away, it will be here before you know it, so it's best to get started now. Excellent tutorial, Heather -- although let's face it, glitter is bound to, um, get around despite best efforts with any kind of glitter-catcher. ;) Your card is so very beautiful! I imagine the gold-copper one looks amazing, too. I agree, that die cut does look like a beautiful stained glass window, and your tutorial explained everything beautifully. Gorgeous end result Heather. 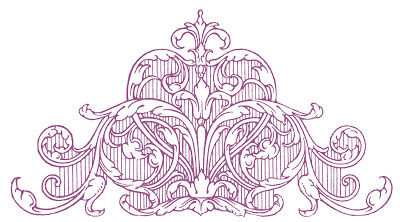 Oh what a lovely sparkly design.